What better way to visit a city than cycling from spot to spot, guided by someone who really knows the place ? 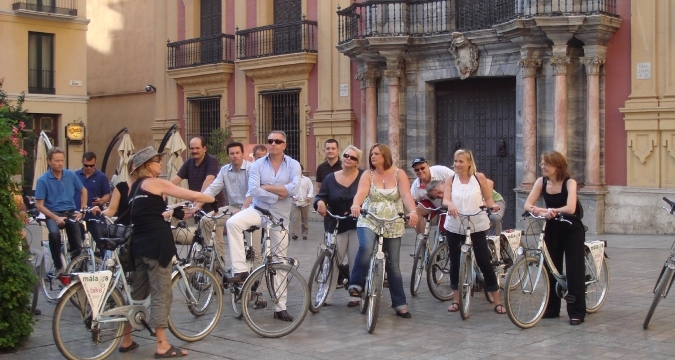 We propose to organise for your goup, from 5 to 50 persons, a guided bike tour in Malaga old town, in order for you to discover each and every interesting parts of this beautiful city. Thanks to the bikes, you will ride through tiny backstreets and pass through hidden "plazas" that most visitors never get to see. With our knowledgeable and entertaining guides, you will wind your way through three thousand years of civilization, ride through the tropical gardens of El Parque and breathe in the sea air along the beachfront promenade, as well as get closer to the fun loving locals- the malagueños. We'll even include a stop in a bar to offer you a typical Malaga wine. Some of the great places you will see during the bike tour are: three of the oldest churches in Málaga; the Atarazanas Market; the main plazas of Málaga; the cathedral; Picasso’s birthplace and the Picasso museum; the Alcazaba, a muslim fortified palace; the Roman Theatre; the port, Paseo del Parque, the promenade; the bullring and much more! This really is a great activity for corporate groups, hens and stag do's, incentives and team building events. Tours can be tailored to the requirements of the group.